I have a pair of Redwing boots that I absolutely love. They are the most comfortable boots I have ever owned, however there is one small problem. I have worn through the leather on the toes of both boots. I have had the boots for around three years, so they have pretty much paid for themselves, but if it wasn't for the holes, I could probably get another year or two out of them. This problem lead me on a search for a toe protecting solution. Redwing does sell a rubber toe cap that is designed to prevent such problems, but to be honest, they look dorky. After a little bit of searching I came across a product called Tuff Toe. Tuff Toe is a two-part colored epoxy that when mixed and cured acts as a durable yet flexible protective layer. 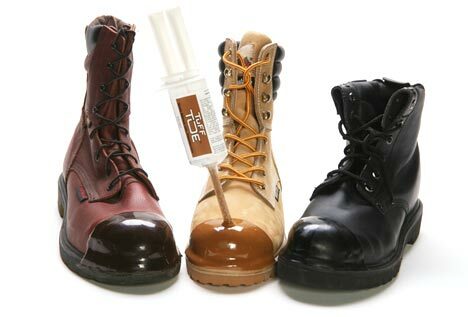 You can use it on your old warn-out boots, or you can protect your shiny new boots. Tuff Toe has been around since the 70's and was originally intended for baseball pitchers. If the product is good enough for the Major League, it is probably good enough for us little guys. A new pair of Redwings will cost me upwards of $120, or I can get the Tuff Toe for $20. Application video after the Read More.